This is the eighth of 12 films that I was “forced” to watch by my fellow bloggers who participated in my Blogiversary Contest last month. This movie was the 1st one chosen by the winner SG. Tnx for the suggestion. Let’s see what I thought of it…. Brief Synopsis – A young boy dreams of winning one of 5 “Golden Tickets” which will allow him to win a global contest arranged by a very eccentric candy maker. My Take on it – For some reason, I never had any desire to see this film and even as a kid it was never high on my list of films to watch. Perhaps it’s because I personally don’t like chocolate. I have been told hundreds if not thousands of times in my life that there must be something wrong with me because I detest anything with chocolate (my kids also can’t understand it). The fact that I also don’t like Peanut butter has even caused people to say I must not really be American. I absolutely loved this film and it was by far the best of all 12 I was “forced” to watch and I’m so glad that SG made me watch it. 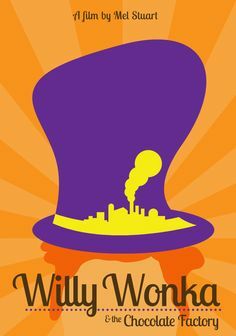 Gene Wilder is absolutely superb in teh title role and he delivers the lines and actions of his characters perfectly. The world of the Chocolate Factory is created and designed so well that we truly believe it is made of a collection of real sweets. The fact that we are able to feel the wonder and amazement of ourselves mirrored by the characters themselves makes it even more personal for all of us. Can’t wait to see this one again…. Bottom Line – Absolutely loved this movie! Wilder is superb as Willy Wonka and delivers the lines so perfectly. They do a wonderful job creating a world populated by candy and chocolate and the amazement and wonder that we feel watching it is mirrored by the characters reactions too. Can’t believe it took me so long to finally see this one. Highly Recommended! Ok, here’s how it is: You can be forgiven for not liking chocolate, even peanut butter. But you have answered correctly when you say you can’t wait to see it again 😉 this is an absolute all-time favorite of mine, mostly because of the music. tnx damien! yep the music is quite memorable too! So glad you enjoyed it! Your non-love of chocolate notwithstanding (I can’t get enough of the stuff), this movie is so classic that I knew you’d like it. This is a classic film from my childhood. I can’t wait to show my kids. Hope they are amazed and blown away by it as I was.